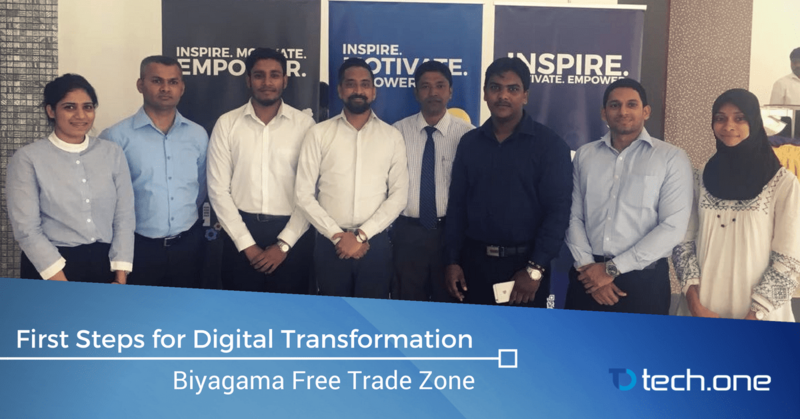 Biyagama Free Trade Zone, Tech One Global together with Microsoft launches an event to spearhead digital transformation. A program to push efforts towards automation, digitization, scalability, and overall increase in productivity through going digital. 23rd March, 2017 – Tech One Sanje in collaboration with Microsoft conducted an awareness program to promote digital transformation for the manufacturing companies in the Biyagama Free Trade zone, a first for one of the most economically volatile areas of Sri Lanka. It was a very interactive session which helped the IT Managers from different companies to understand how to improve productivity and efficiency using Enadoc, Azure, Office 365, and Power BI. This is the first time that IT departments got together for an interactive session. With around 30 participants and 16 companies, the initiative became a success. The session revolved around the current path that digital is currently taking. A strong focus on automation, cloud, integration, collaboration, and accessibility was the foundation of interactive discussions. The event surfaced potential entry points in digital transformation like Azure and its Microsoft certified scalability and security as a solid foundation, Enadoc as an initial tool of transitioning the physical realm to digital, Office 365 and Power BI as tools to empower the business operations, and of course the power of strong partners like Tech One Global in helping and guiding industries willing to take the exciting digital transformation journey to disrupt the business norms.